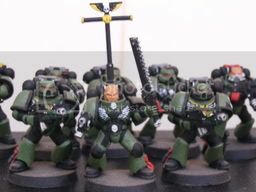 wow they are great and I really like the face but I was wondering if you are going put a darker green or are you going to do a successor chaptor? But they are really nice and neat! 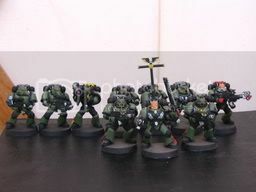 the scout&#39;s have a darker green and i&#39;m going to work it into the new model&#39;s. more and more of it will appear as the army grow&#39;s and different units are added and they all have some of it already. That mass/mob picture is well set up, and has me sold on em. They look great, charging forward, like marines are apt to do! hell yeah! I didn&#39;t even plan it that way. I snapped it and when I saw it for the first time I was like, wow! it&#39;s the only one that came out like that.